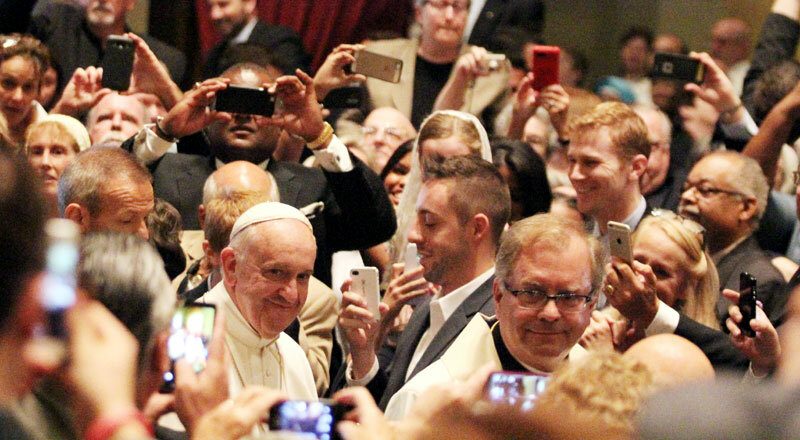 Pope Francis’ visit to Philadelphia beginning Saturday morning, Sept. 26, and continuing through Sunday represented more than smiles and cheers from the crowd for arguably the world’s most popular man today. 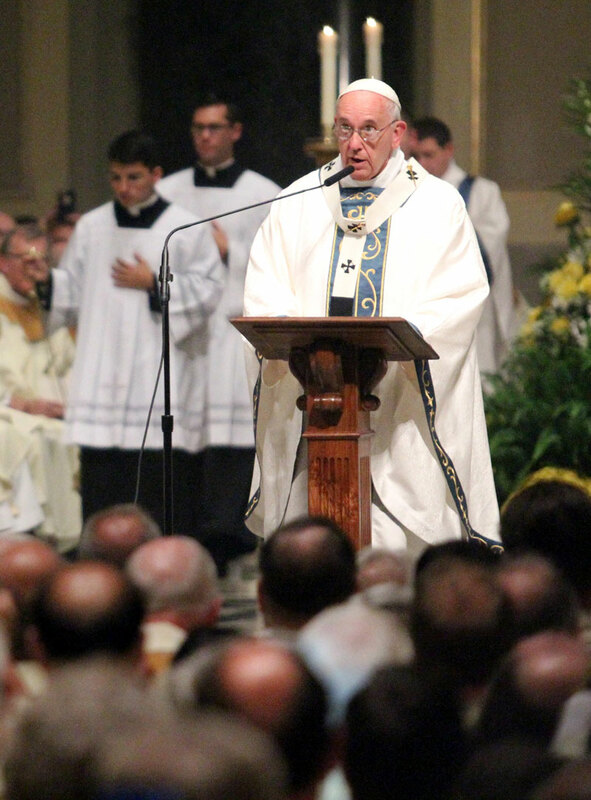 Reaction from the 1,600 Catholic priests, deacons, men and women religious and lay people from across the Philadelphia Archdiocese attending the papal Mass at the Cathedral Basilica of SS. Peter and Paul suggested the presence of the pope was a cathartic remedy for a local church ready to emerge confidently from the most turbulent decade in its more than 200-year history. The pope’s stop in Philadelphia closed the Eighth World Meeting of Families and began the final leg of his three-city apostolic visit to the United States this week, after two days each in Washington and New York. From Tuesday to Friday, Sept. 22-25, some 20,000 souls had descended on the city from across the U.S. and from 100 countries, making it the largest triennial World Meeting ever held. Many of those pilgrims stayed in the city after the last session Sept. 25 to join the papal events for the weekend in a carnival atmosphere. But Saturday morning’s Mass celebrated by Pope Francis had earlier been billed as one “for the people of the Archdiocese of Philadelphia,” and the invited faithful participated in an elegant, sublime and emotional liturgy. The adjoining Chapel of Our Lady of the Blessed Sacrament was also filled, bringing the number of worshipers up to 1,600, organizers of the Mass estimated. The 10:30 a.m. Mass began with Pope Francis wearing simple white vestments and following a long procession including the auxiliary bishops of Philadelphia, current and retired bishops of Pennsylvania dioceses, and directly behind a beaming Archbishop Charles Chaput. The 100-voice combined Cathedral and Archdiocesan Choirs, led by David Kimock and backed by a small orchestra, led the congregation in the Marian hymn “Hail Holy Queen,” in honor of the day’s votive Mass for our Lady, Mother of the Church. Sung by the choir and congregation with such devotion, more than a few people were moved to dry tears from their eyes. The pope used the example of Philadelphia’s first female saint, St. Katharine Drexel, to inspire everyone in the cathedral to take up a mission of service to the church. That pope’s words to a young Katharine changed her life and “made her think of the immense work that had to be done, and to realize that she was being called to do her part,” Pope Francis said. Pope Francis called everyone to “a sense of personal responsibility for the Church’s mission.” He urged them not to rely on “maintaining our structures and institutions, which have served us well,” but by “being open to the possibilities which the Spirit opens up to us and communicating the joy of the Gospel, daily and in every season of our life,” he said. He also called for a renewed emphasis on the participation of lay people in the church. Pope Francis gave thanks for the contributions of religious women and men, and the leadership of priests in the archdiocese. He prayed that the Blessed Virgin Mary, “with a mother’s love,” would intercede for the growth of the Catholic Church in America. “I pray for each of you, and I ask you, please, to pray for me,” he concluded. Pope Francis celebrated the Liturgy of the Eucharist with the hundreds of concelebrating priests and bishops, joined on the high altar by Archbishop Chaput, retired archbishop of Philadelphia Cardinal Justin Rigali, and Auxiliary Bishops Timothy Senior and John McIntyre. After communion, Archbishop Chaput welcomed Pope Francis to Philadelphia. The two men walked into the center of the cathedral sanctuary and embraced, to the thundering applause of the congregation. It was sustained as the pope gave the archbishop the gift of a gold chalice, and continued as they embraced again. As the Mass ended the pope walked through the cathedral and into the chapel, where another roar of acclaim arose as he entered the chapel doors. He blessed sick children lying in wheeled beds in front of the first pews, then exited the chapel to conclude the liturgy.